April 8 — Rajasthan sun is merciless. Hot dry breath of wind blows over the dunes and through the ancient desert town. Am in India’s western border. Jaisalmer used to be trade post between east and west, until sea trade replaced camel caravans. After independence and partitioning of India, 1947, Indian-Pakistani border closed much of the regional trade as well. 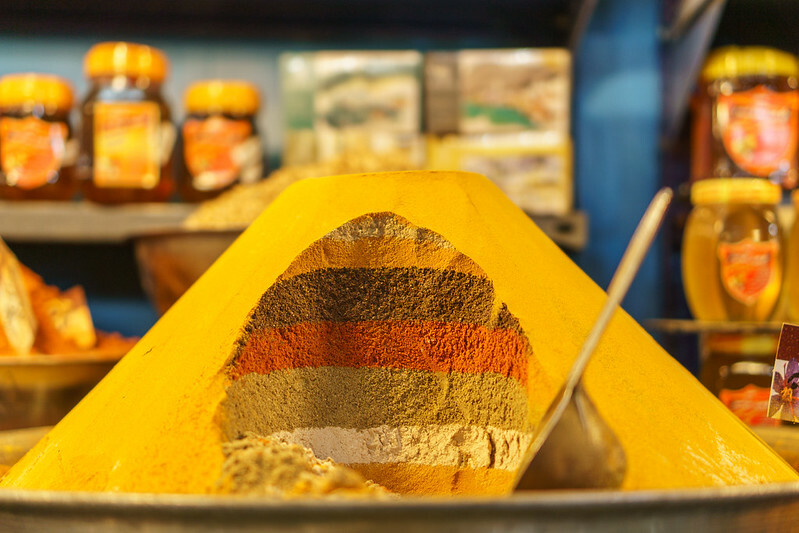 Name Golden City comes from yellow sand stone that is building material for majority of buildings. April 14 — Continued my journey to Jodhpur, the Blue City. Weather here has been nice relief after Jaisalmer. It has rained every afternoon. Yesterday night winds were strong and thunderstorms did show of drum and light over the Mehrangarh fort. Fortification stands on a cliff, and city has grown around it. Houses are colorful and have more variety than in Jaisalmer. Areas in old town are painted blue, from which city has gotten its name. Tradition originates from cast divisions that dictated who were living where. Rich merchants used to show off their wealth, by building their homes extravagantly. They are called Havelis in Jaisalmer. Zenana Deodi. The inner courtyard of Mehrangarh fort was once guarded by eunuchs. This is where the Maharaja’s wives lived. Fort is definitely worth visiting. Audio guides were excellent, and place is fascinating adventure to history both in and outside. Marwars of Jodhpur had semi-autonomous status during reign of Mughal centuries (1526–1857). Wild desert region and proud warriors living here proved too much for even mighty Mughals to repress entirely. While walking by the big entrance gate of Jodhpur castle, I noticed curious hand insignia’s carved by the gate wall. They were painted in red and had decoration of fresh flowers on them. This is a shrine for widows of Maharajahs that had committed a Sati (seti, suttee), a self immolation. Jauhar had to do with harsh reality of desert life: isolated communities living where marauding armies could (and did) appear out of nowhere and without warning. 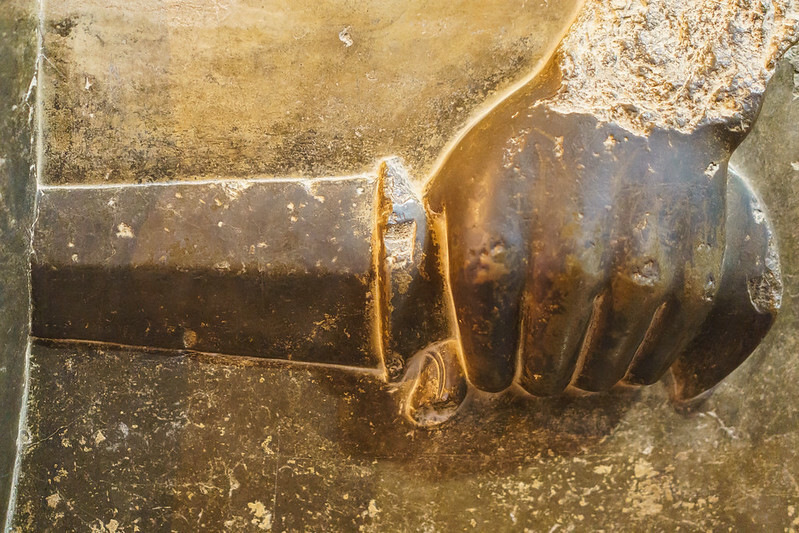 Jauhar, for men meant fighting and dying a certain death in hands of enemy. These events repeated several times during the history of Rajasthan. British banned immolations in 1829 and later independent India continued the work. Sati Prevention Act from 1987 makes it criminal to aiding, abetting, and even glorifying the act of Sati. Paintings … include the scene of a banquet in Persian and Indian style in which the wedding ceremony of Reza Qoli Mirza, son of Nader Shah and an Indian princess is shown. Another part of the picture is “Seti” ritual in which some Indian princesses commit suicide by being burnt with the corpse of their deceased husbands and this is regarded as a sign of their intense love. Aside the fact that such ritual was also known in Iran, during the rule of Shah Abbas the second an event happened which connected this ritual with Kandahar conquest episode. Probably the significance of the event for the Safavid culture system caused its illustration upon a Chehelsotoon wall. One of the most important historical events during the reign of Shah Abbas the second was re-conquest of Kandahar by Iranian army from Indian Gurkanis (Mughals) in 1655 AD. As a story goes twenty days after the beginning of Kandahar siege by Iranian troops, one of the high ranked Rajas of Indian Gurkanis by the name of Matrodas … passed away suddenly. His distressed wife decided to observe the Seti ritual according to her ancient religion. Therefore, she adorned herself with various jewellery and got ready to set herself on fire. Afterwards she took her husbands body and went toward the fire accompanied by her relatives. At this time, Dolat Khan, governor of Kandahar tried to change her mind by giving advice but she remained silent and reluctant. When Dolat Khan and his attendants found out that she is very determined in her cause, they allowed her to go on. At this time the woman began taking off her jewellery on her way and throwing them toward the crowd. After reaching the destination she sat down and embraced the head of her husband. By this time, her relatives had brought a pile of firewood and after putting it around the dead man and the bereaved woman, had set it on fire. Rajput Hindus of the time believed that the words of anybody who was committing suicide in this way was trustworthy and would come true doubtlessly. Therefore, Dolat Khan sent a man to ask the dying woman whether the kind of India would dispatch any reinforcements to break Kandahar siege and whether the Qezelbash army would return to Iranian court empty handed? At this point the woman was not able to talk anymore because the flames consumed her entirely. After this event the messenger of Dolat Khan told him what he had heard which made the governor and his attendants quite disappointed. After forty days her forecast came true and the Iranian army entered Kandahar. Shah Abbas the second became very impressed by this story so he ordered the depication of it on the walls of Chehelsotoon in order to pay his respects to that courageous woman. Cannon in Mehrangarh fort museum. 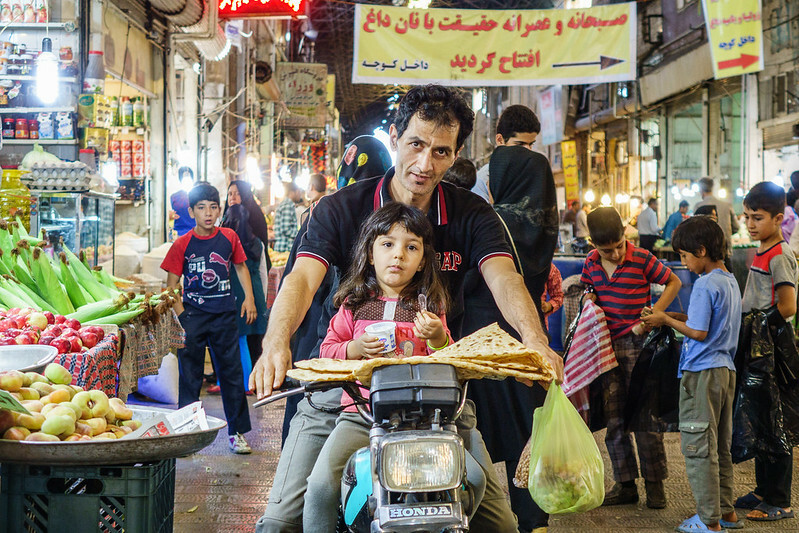 This post is part of series documenting travel in Myanmar, Cuba and Iran: Introduction. Arrived Tehran early morning after flying through the night from Helsinki. Clear skies forecast a hot day, but early drive from airport was still mellow, almost cool. While searching the accommodation before my trip, found an article from 2006 about Hotel Naderi in downtown Tehran. It painted so interesting picture about the place that had to go and see it myself. Hotel Naderi at Jomhuri Avenue, Tehran. 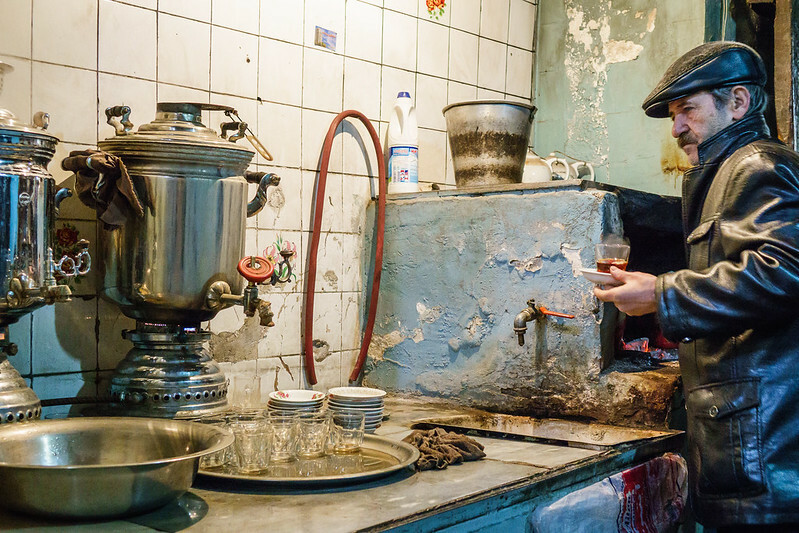 Gone are most of the Armenians, the businessmen who lived and played well during the Shah’s reign, the American tourists and the alcohol hawkers next door, as well as the cosmopolitan air that made the place an emblem of a Tehran in which East and West seamlessly mingled. After some sightseeing in capital, I started a circle (Tehran-Qasvin (& Alamut)-Rasht-Ramsar-Chalus-Tehran) to the coast by heading road towards Qazvin, an old capital in the north west of Iran. Main attractions for visitors in Qasvin is to do a trip to Alamut. To reach the castle one has to drive 100km on mountain roads that reach above 2300 meters on the highest places. Views are, as one can expect, stunning. I had to ask driver stop for photos all the time. Lacking their own army, the Nizari relied on these warriors to carry out espionage and assassinations of key enemy figures, and over the course of 300 years successfully killed two caliphs, and many viziers, sultans, and Crusader leaders. Assassin headquarters was the sturdy Castle of Alamut (Map), deep in the Alborz mountain region. Fortress was adapted to suit their needs, not only for defence from hostile forces, but also for indoctrination of new followers. Visiting the place today, its not difficult to grasp how hard the life on the mountain top must have been. Water reservoirs are one indication of how necessities of life have been on the priority, especially when one of many enemies had brought an army and siege the mountain. 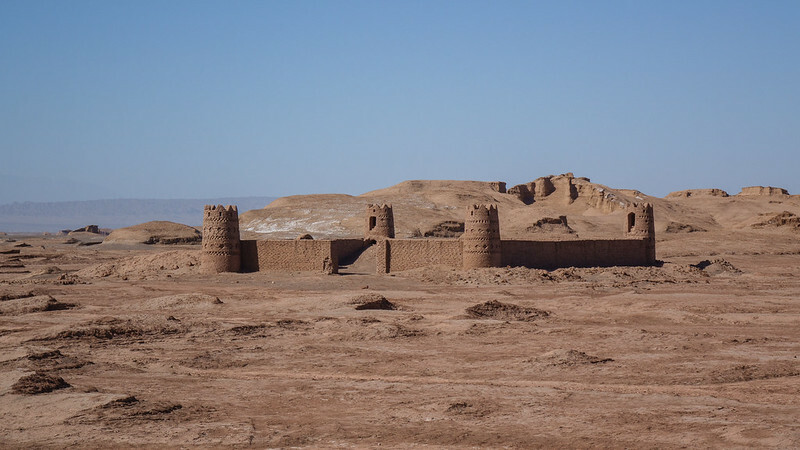 Assassins finally met their end at the hands of Mongols in 1256, when their castles surrounded, including the main one in Alamut. Moving on, road north of Qasvin progresses mainly through valleys and views are still pretty scenic. Bus from Tehran to Rasht takes about 5-6 hours and around two from Qasvin. Views north and south of Alborz differ a lot. Coast is tropical, lush, green plateau where rolling hills gradually growing into mountains further inland. Nature is in strong contrast to majority of the country because mountains block winds spreading moist to south, thus creating a natural green house of a kind. Crickets are whirring in trees and winds create breeze that helps with the heat a bit. Towns and townlets are dotting the coast in every 10-20kms. One can ride a horse, a beach buggy, or just hang around at waterfront and swim your hearts content. Sandy beaches are hard to come by, its mainly small stones everywhere. Pedestrian streets in Rasht downtown. My first stop was Rasht, not by the coast so decided to move on next morning. After finding a share taxi, trip continued to my main destination, Ramsar. Ramsar is a beach and resort town of the north Iran. Its heyday was before the revolution, but is still nice place for a visit. Ramsar also hosted a residence of Shah’s summer escape from the busy capital. Building is nowadays turned to museum. Rooms have their original furniture and items, and showcase the opulence in which monarchs once lived. Finding a room in Ramsar seemed like a problem first, but there were plenty of accommodation by the seaside. Landmark of the town is the two kilometre casino boulevard, coming from old Hotel Ramsar to the casino by the beach. Its nice place for leisure walks and talks with locals. Alley is surrounded by tall palms and other trees and vegetation is well maintained. Casino boulevard and walking street in Ramsar centre. Summer residence of Persian Shah. Before returning to Tehran, I stopped one more night to Chalus, last stop in my trip. Place lacks the historic sights, but welcomes those who come for the sun and sea. Cluster of businesses are occupying every strategic part on the beach, and its hard to find a place where someone isnt asking money for staying. Many Iranians pack whole family from toddler to granny into car, and go to camping instead of buying into some establishment. Road from Chalus to Tehran is famous for its great views. Traffic is quite intense. 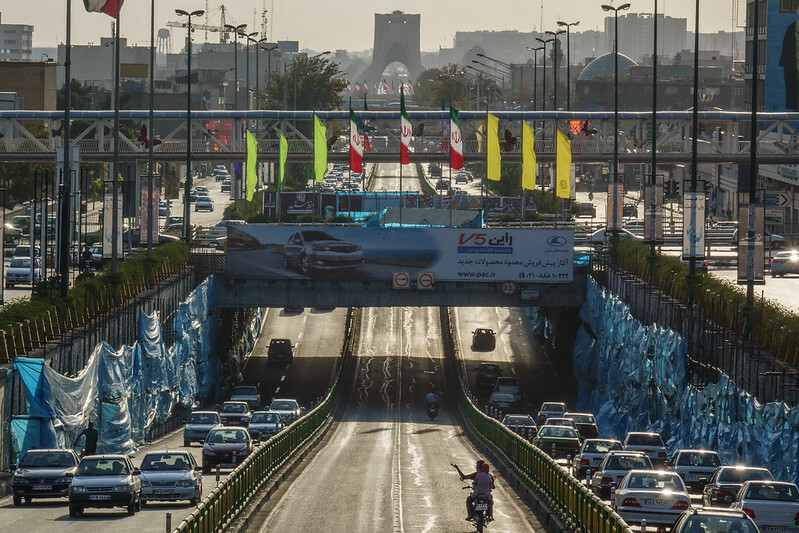 Having own car, perhaps rented right after arriving to airport in Tehran is good option, if one can live with the driving culture. In bigger roads, speed control is quite rigorous but overtaking, cutting corners, changing lanes provide hair raising experiences. 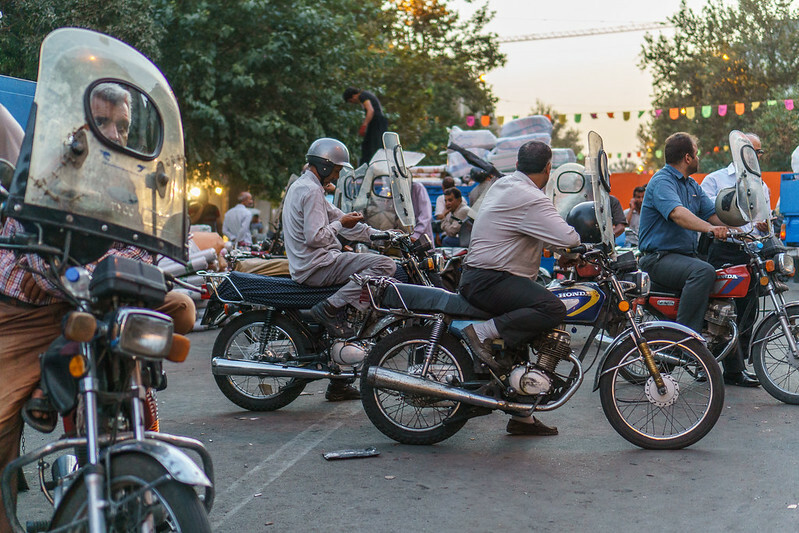 Iranian bus network is well developed and easy way of reaching every corner of the country, but local sights are often not in walkable distance. Taxis don’t cost much, but it still takes part of freedom away, knowing there’s some dude waiting in hot car while you are sightseeing a garden or a museum. Golestan Palace, residence of Shah is a museum nowadays. 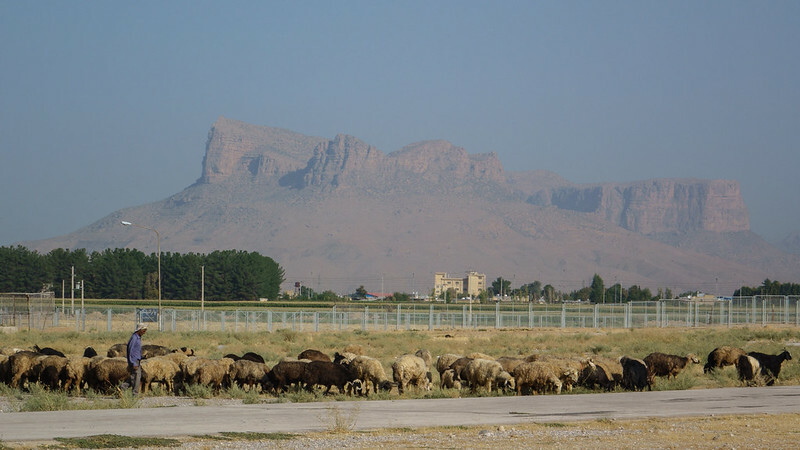 Minibus is nearing Marvdasht, a small town near the historic park of Persepolis. Commuters from Shiraz have filled the vehicle. Curiously, town itself does not provide much accommodation, perhaps because Shiraz is just 50km away. Sun at 8am is already getting hot, soon it will be over 40 Celsius. 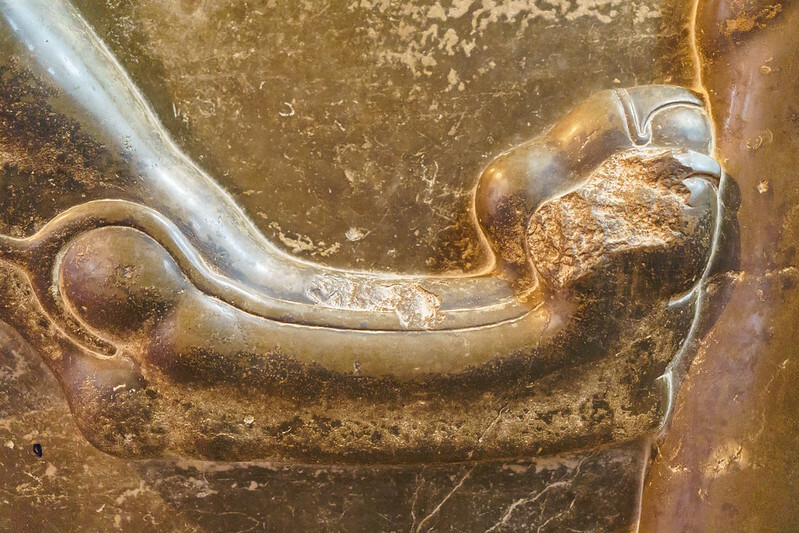 Akinageh, Achaemanid dagger and paw of a lion. 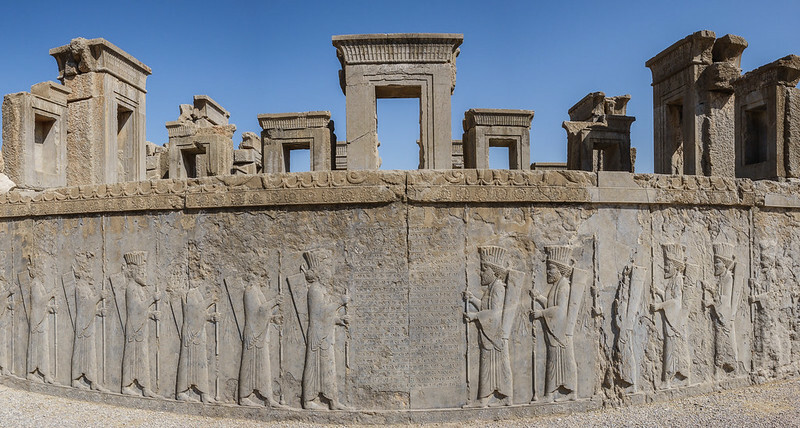 The endless struggle between good and evil, Ahriman and Mino was depicted in many palace walls of Persepolis. 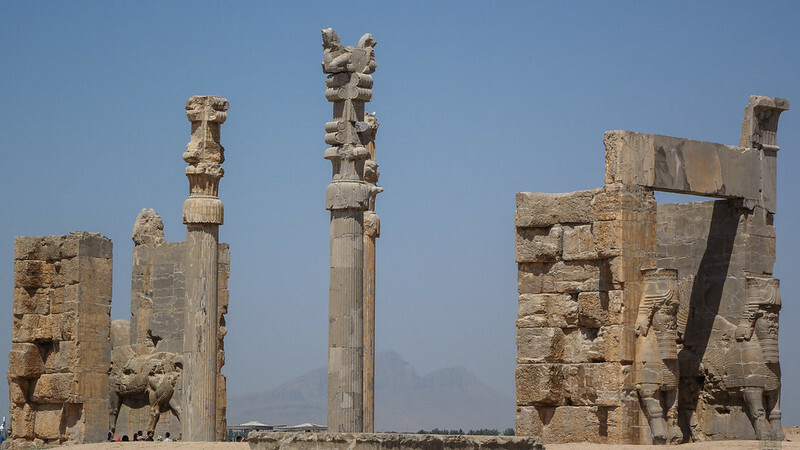 Persepolis literally meaning “the Persian city”, was the ceremonial capital of the Achaemenid’s (ca. 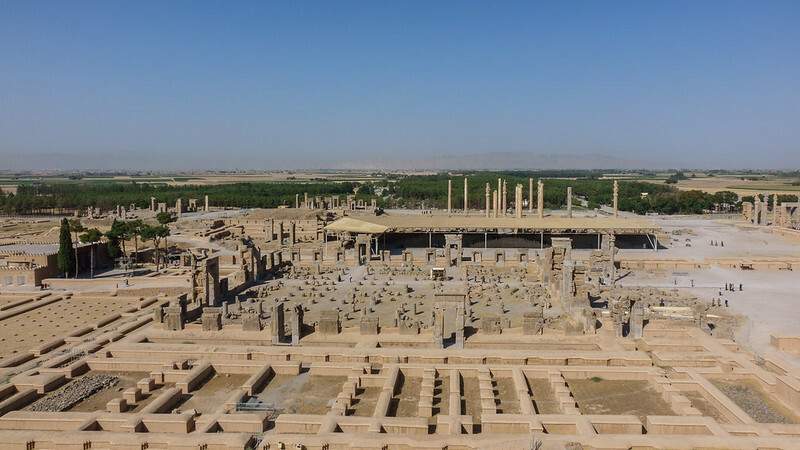 550–330 BC) and was built as a showcase the might of an empire. 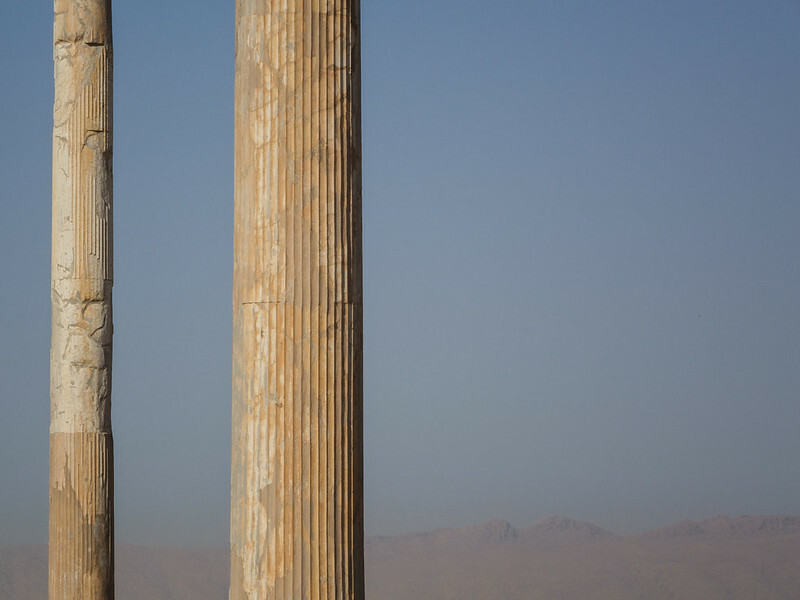 Glory days of Persepolis came to an abrupt end, when Alexander the Great stormed the city and looted it. Conflicting theories exists still today if the destruction intentional or accidental. Still, what remains visible gives an idea of what once stood here, on a dry plain near the small river Pulvar. An unfinished gate in Persepolis. 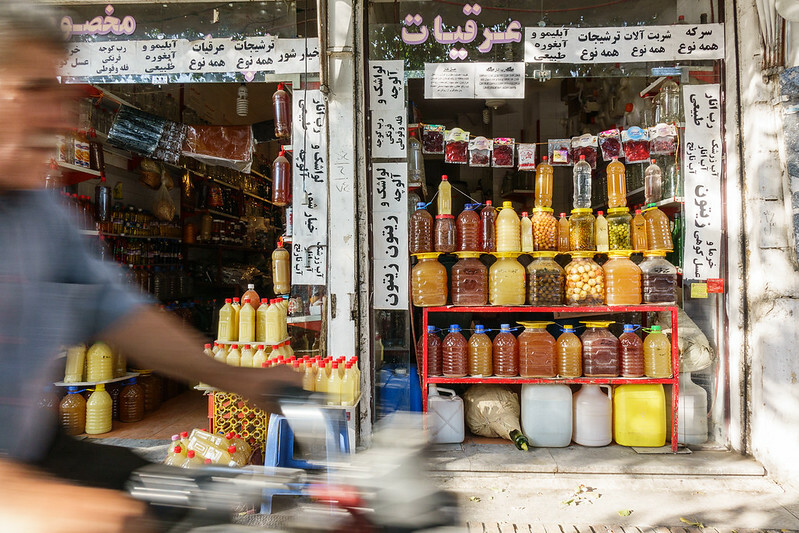 Shiraz is the major city of 1.3m people in southern Iran. 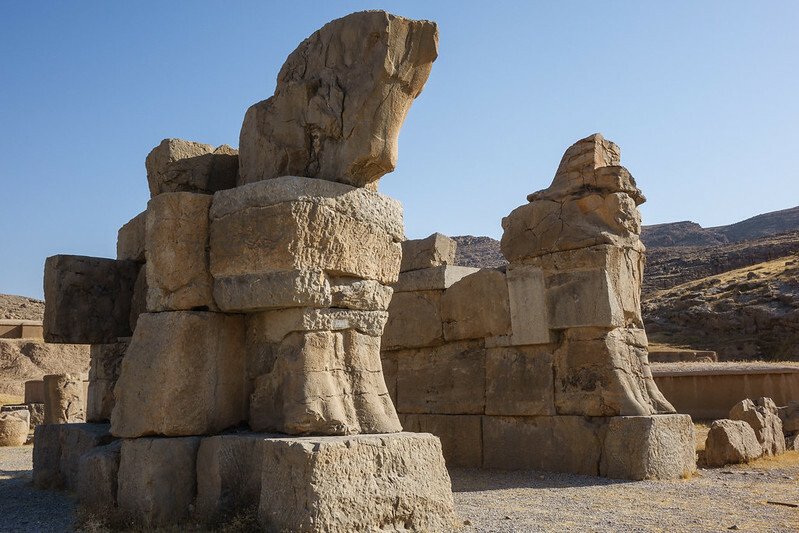 Historic park of Persepolis is just one of attractions that the city can offer. 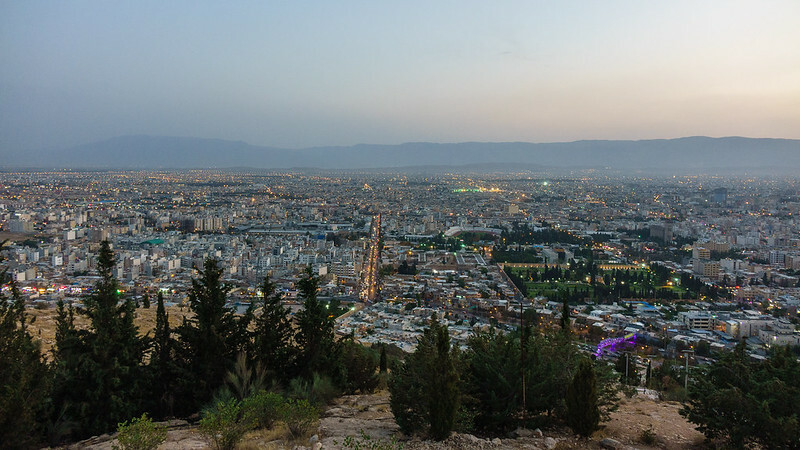 Capital of Persia was moved several times during history, and Shiraz time was during the Zand dynasty’s era (1747-79). 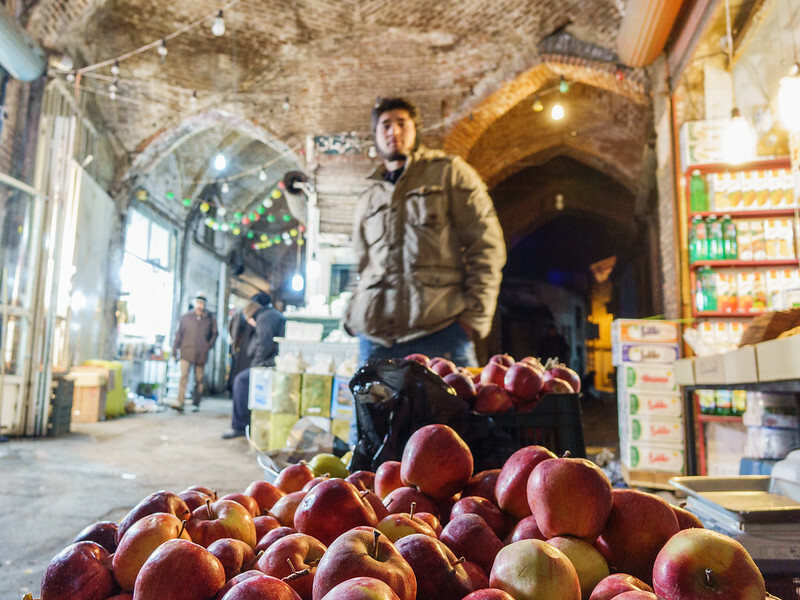 Several renowned poets are linked to the city, and its a treasure throve to Persian culture, culinary art and wines. 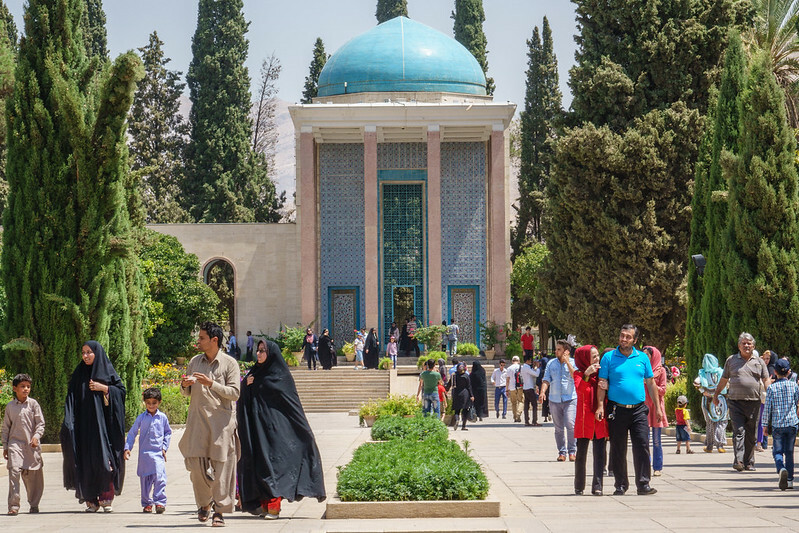 Persian gardens, mosques and ofcourse, a large bazaar adds to the attraction. 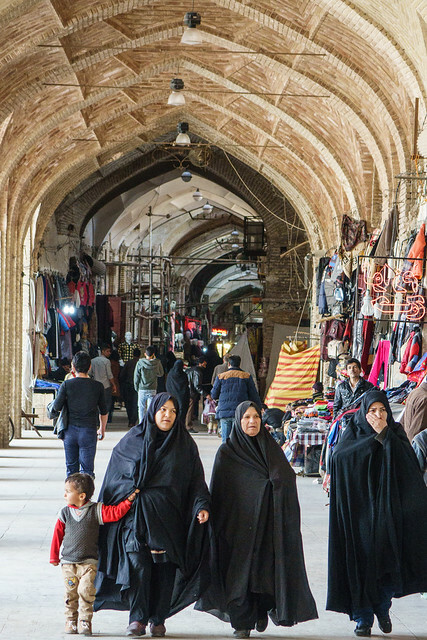 Shiraz is easily one of the most popular travel destinations of Iran. Shah Cheragh. 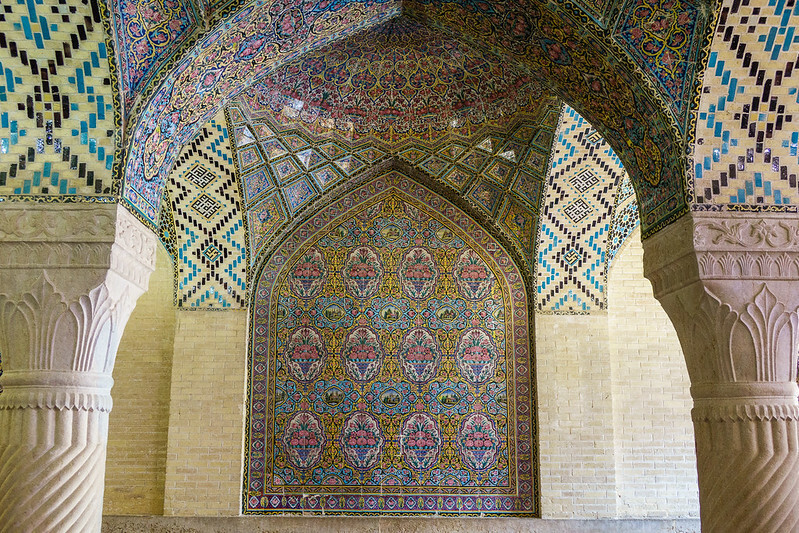 Funerary monument and mosque in Shiraz center. Karim Khan Castle, a citadel in the downtown Shiraz. And someone taking a perfect shot. 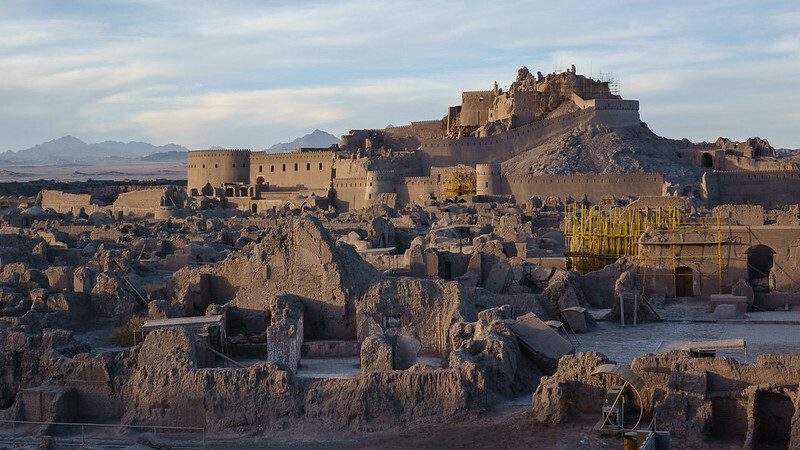 Mud city and citadel of Arg-e Bam, South Iran. Bam was starting point for trade routes heading eastwards to Pakistan and India. Travelers through ages have stopped and awed its massive walls and buildings. Silk Road traveler Marco Polo being one of them. Kalouts, at the edge of Dasht-e Lut desert, South East of Iran. Imagine Kalouts: constant pleasant wind, rock formations continuing to horizon, heat emitting from ground, further away an oasis with palm trees and vegetation. Wind always blows from the same direction, reason of the unique rock formations. Besides the gentle whistle, an unbroken silence. Open the map, turn the satellite on, zoom out, to see the location yourself. 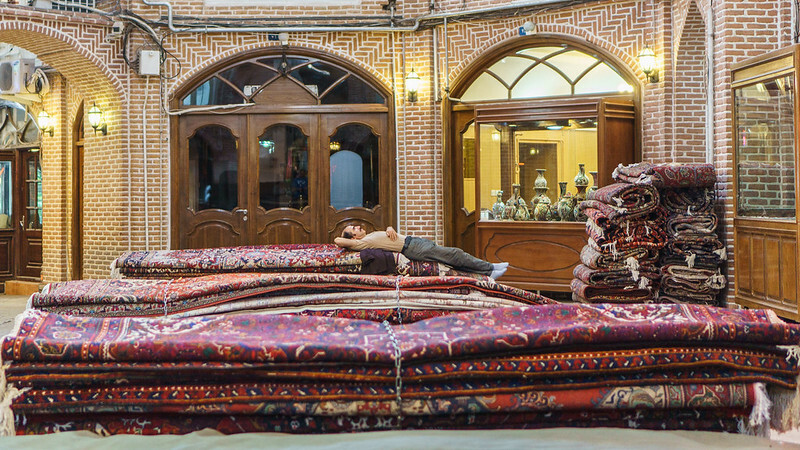 Caravanserai can be described in English as a road side inn. 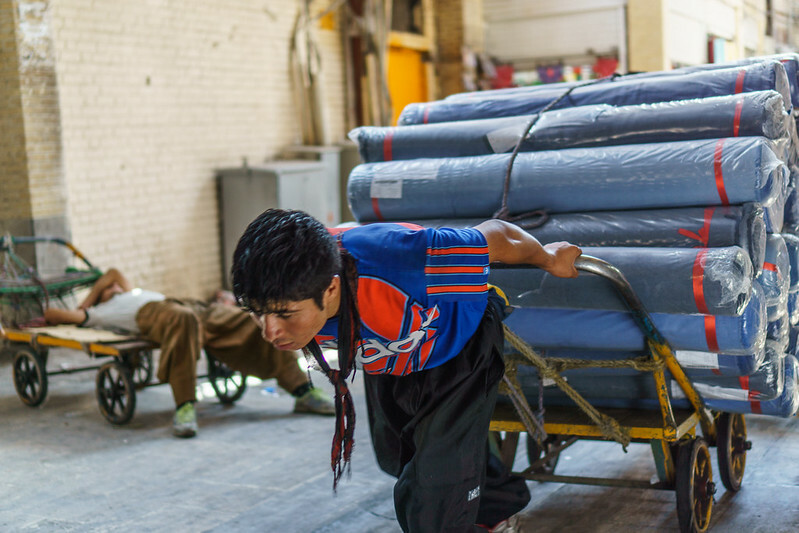 Its a fortified yard where caravans could rest, instead of risking overnight out in the desert – not always the safest of places during uncertain times. 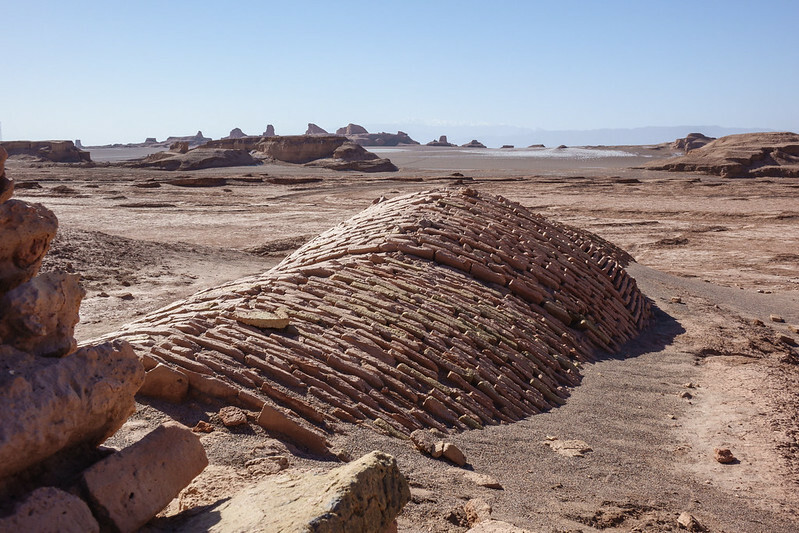 It was often build in a place where it could serve as a water storage as well, a vital necessity in hot dry desert regions that caravans had to cross. Caravans did long distance travels in North Africa, Middle East and India, so network of caravanserais were needed in regular distances along the routes. Such building project would have not been very thorough, unless regional rulers helped making it possible. Obvious benefit being increase of taxable commerce, as well as exchange of information and people. 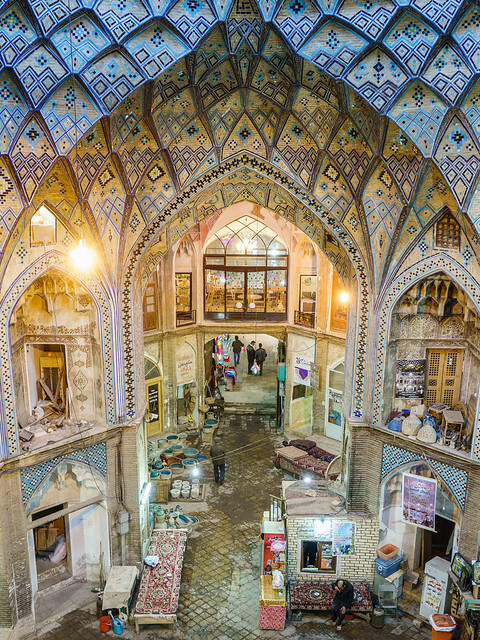 In urban areas logical place for a caravanserai was as part of bazaar, where commerce could be made, news shared, and people meet. 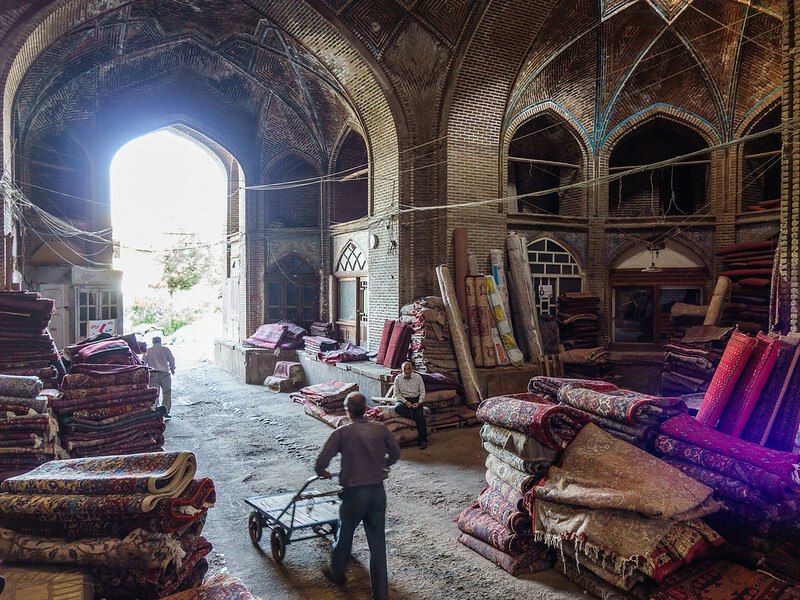 Even when its old purpose has disappeared, many Iranian bazaars still feature a caravanserai. Bazaars are still very much in use and interesting places for people watch. Abundance and variety of the goods on sale is also interesting. 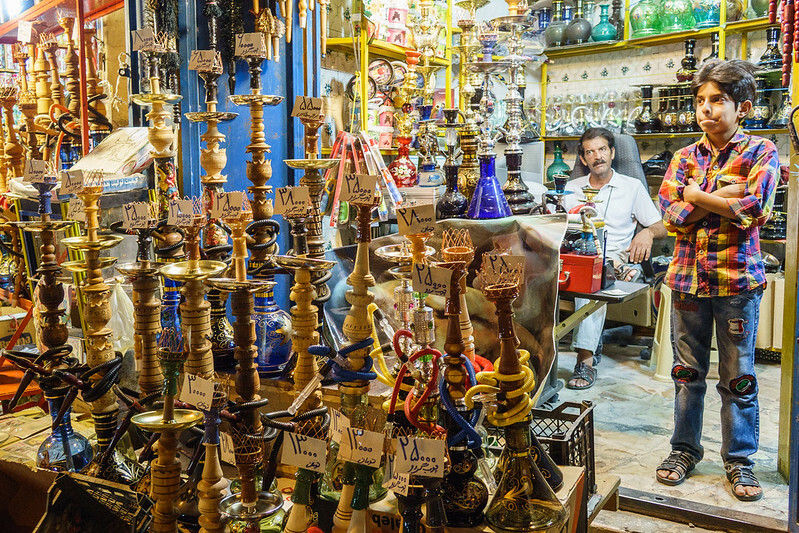 Persian carpets, spices, jewels, hand crafts are the traditional items visitor can satisfy his/her shopping binge. 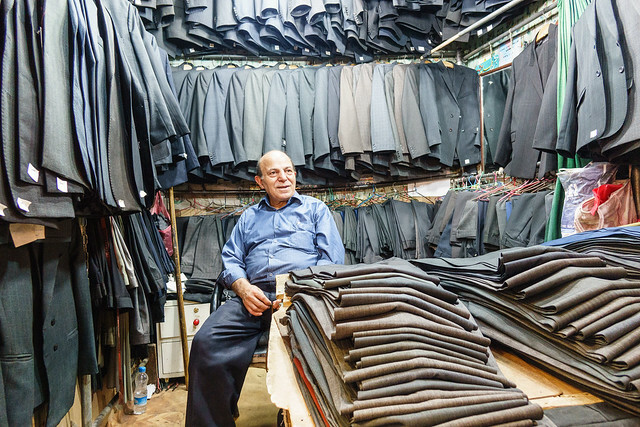 But everything else too, varying from Chinese electronics to Indian clothes to Turkish tools to pretty much anything imaginable. 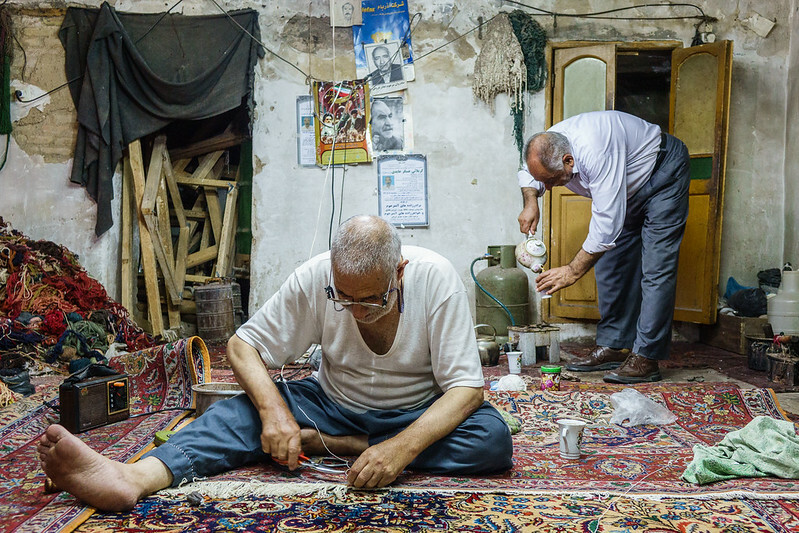 Last photos bellow are from Kashan, one of personal favourites in Iran. 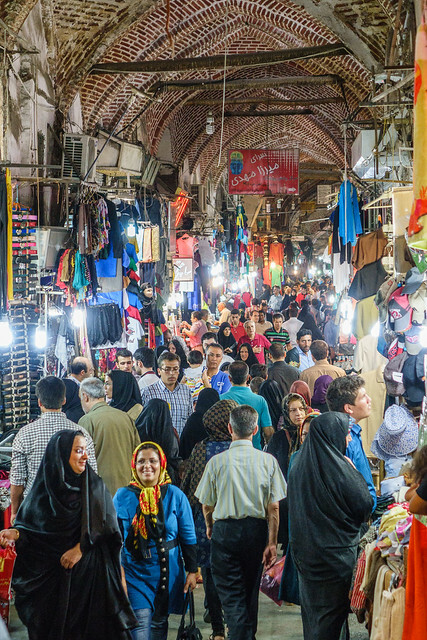 Bazaar is large, lively and authentic, with genuinely friendly Iranians both as sellers and customers. 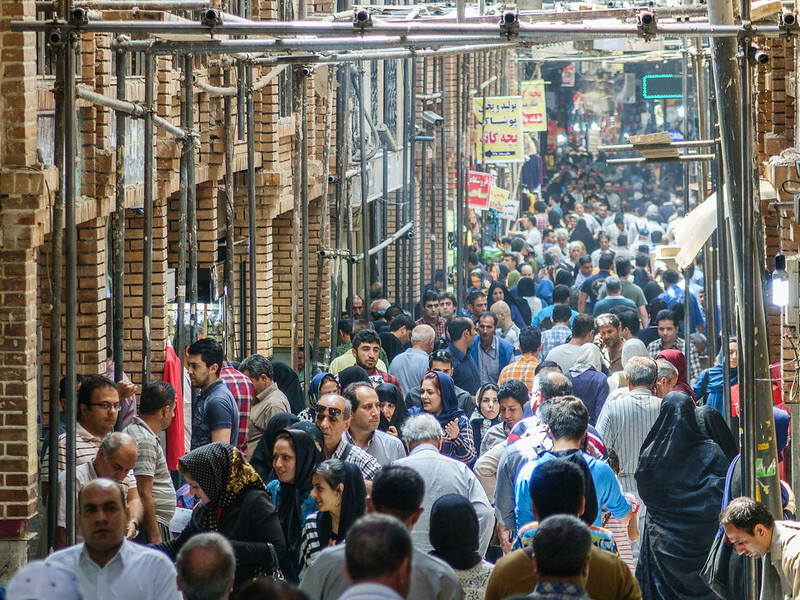 City is not as popular tourist destination as Esfahan, Yazd and Shiraz, undeservedly so! 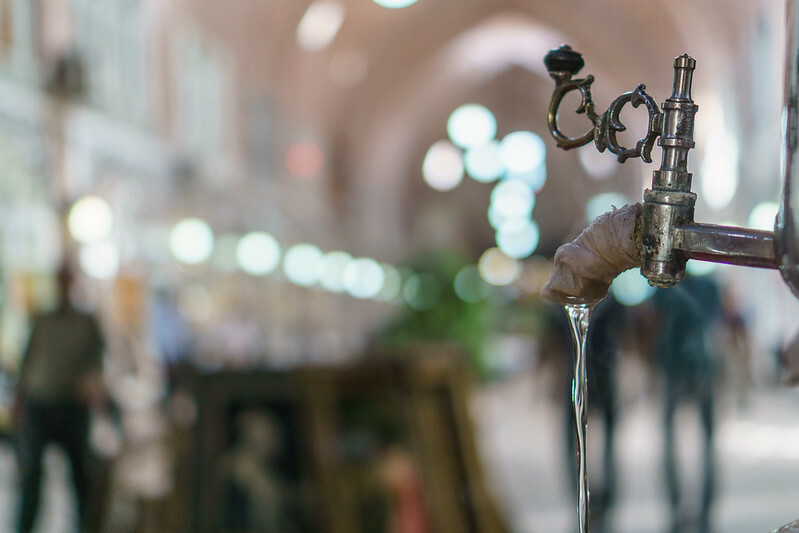 Standing in Tabriz bazaar feels like being in the halls of large cathedral. And at the same, in a maze zigzagging to surprise directions with new corridors and halls. At parts, crowded with people and other, desolated with just few passers by. Instead of taking a map, I prefer to get lost. Watching, wandering until exit on some random point and can relocate myself again. 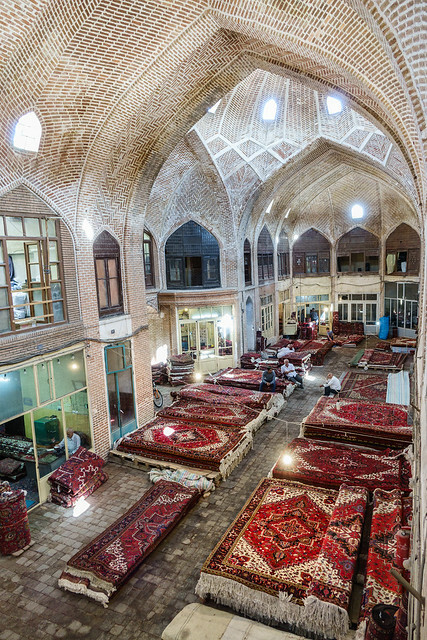 Bazaar of Tabriz is the largest in the world today, and dates back to the 13th century. 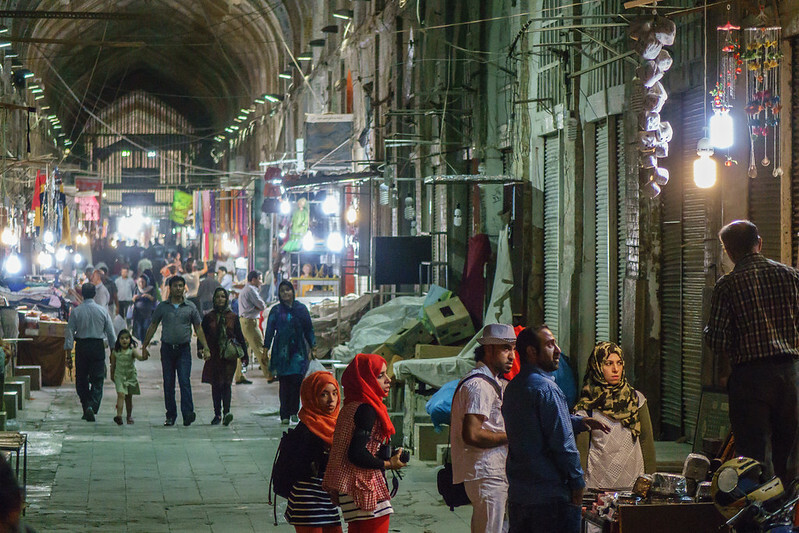 The complex covers 27 hectares with over 5.5 kilometres of covered bazaars. Its still very much in its original form, if there can be an original form for something that lives day by day. 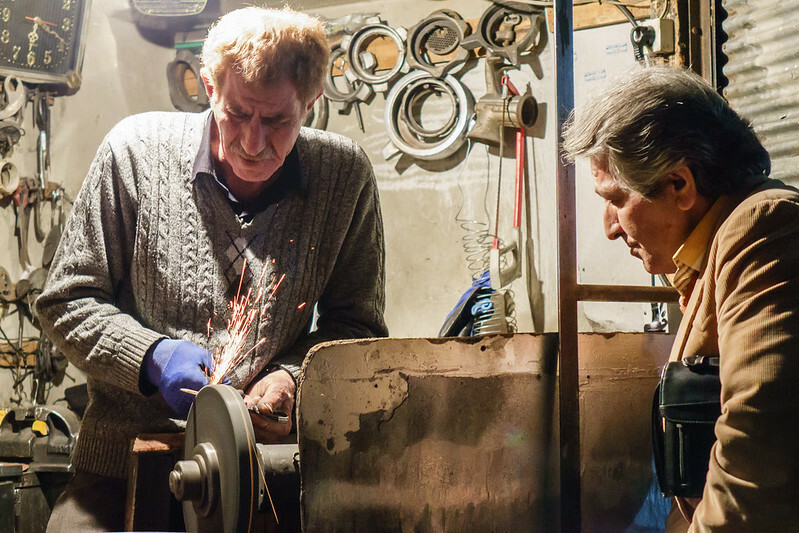 Preservation efforts started back in the 1970’s. Today its a must-see spot for anyone visiting the city. 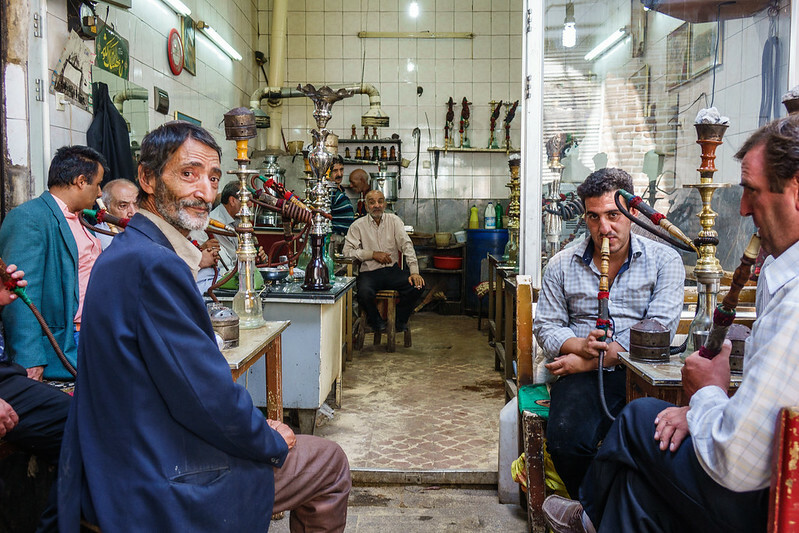 Waterpipe’s, or as Iranians call it, ghelyan, are bubbling in choir in a small tea house. Am just having a cup of tea and watching other visitors enjoying their tobacco and talking. Room is on the second floor, with a tiny window down to one of alleys. There daylight pours in from the ventilation holes in the ceiling, and dust raised by the constant traffic is beamed through. All scenes not changed much for generations, and among many other impressions, part of the magic of bazaar. 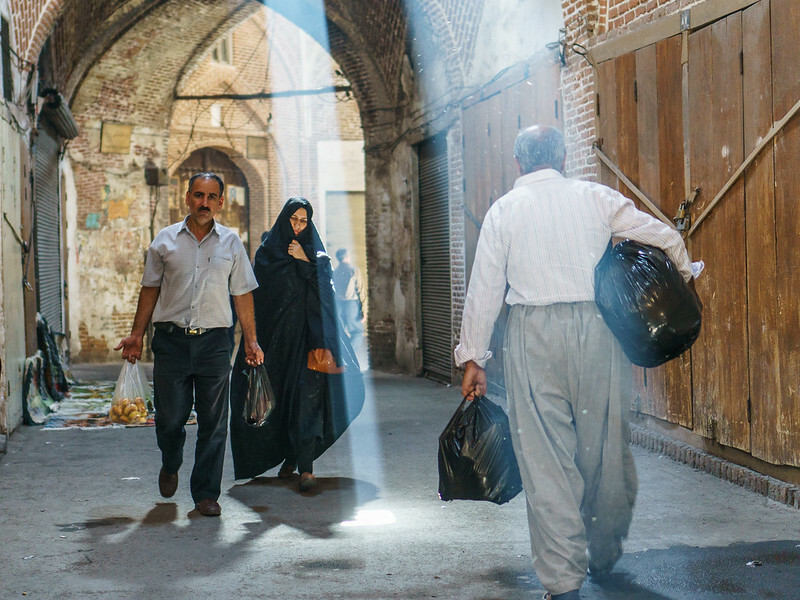 All the photos in this post have been taken in Tabriz. 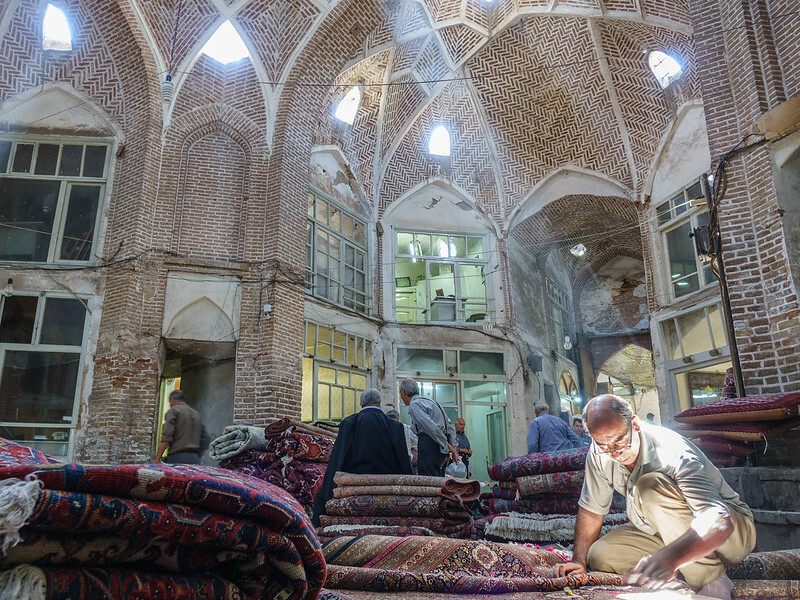 Here’s second post about bazaars and caravanserais of Iran, in general. August 2015. 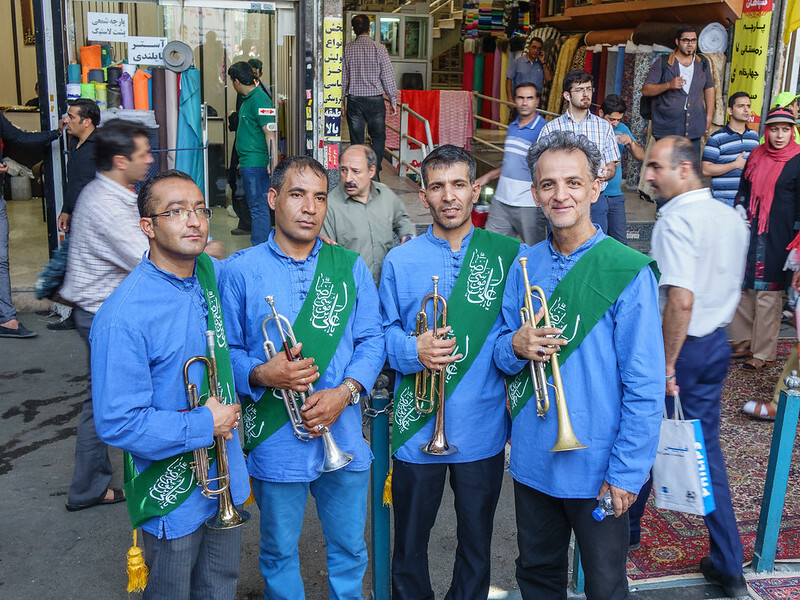 Esfahan feels nice relief after crowded hot Tehran. Old bridges over the river Zayandehrud are charming, wish there was any water though. Cool evening winds after exhausting day are blowing over Naghsh-e Jahan Square, great example of Iranian and Islamic architecture. Families are outing, kids playing and adults talking, relaxing. Ceiling of Lotfollah Mosque. Mosque was used by the court and had a secret access to it from Ali Qapu Palace across the square. Mosque does not have minarets at all, since the call for public prayer was never needed. Square was center of imperial capital for public appearances and polo matches. Royal palace and court, important mosques and bazaar also surrounding it. Wikipedia: [city] regained its important position during the Safavid period (1501–1736). The city’s golden age began in 1598 when the Safavid ruler Shah Abbas I (reigned 1588–1629) made it his capital and rebuilt it into one of the largest and most beautiful cities of the 17th century. Armenian church in New Jolfa, district of Esfahan that was established 1606. 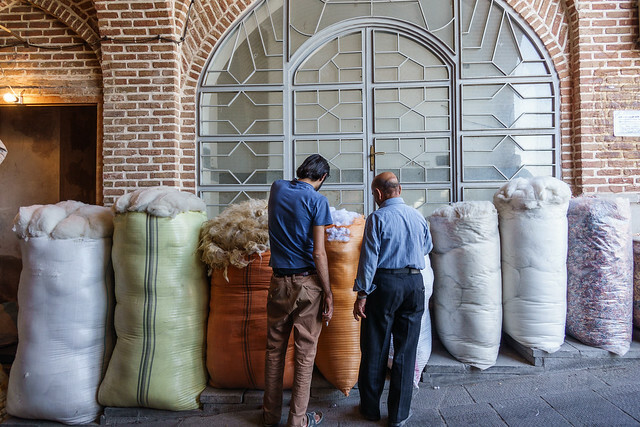 Original Jolfa is in Iranian-Armenian border, from where people were transferred to live in Esfahan. Ancient Yazd, town at edge of Dasht-e Kavir desert. Architecture of Yazd old town is a maze of mud houses and curvy corridors. From its outer appearance, Jame Mosque is perhaps most beautiful mosque I’ve seen. 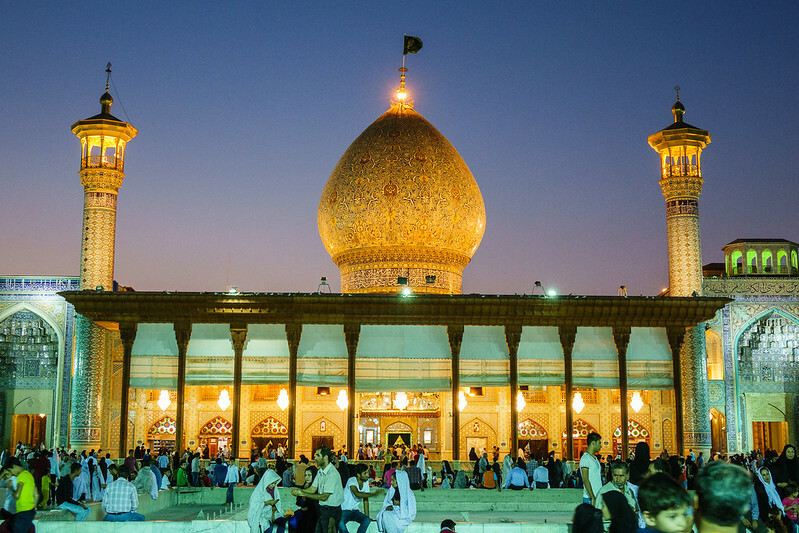 Minarets are higher than ones in Esfahan. One reason is that they were used as beacons in old times. Where landscape didn’t permit this function, minarets didn’t need to be so high. 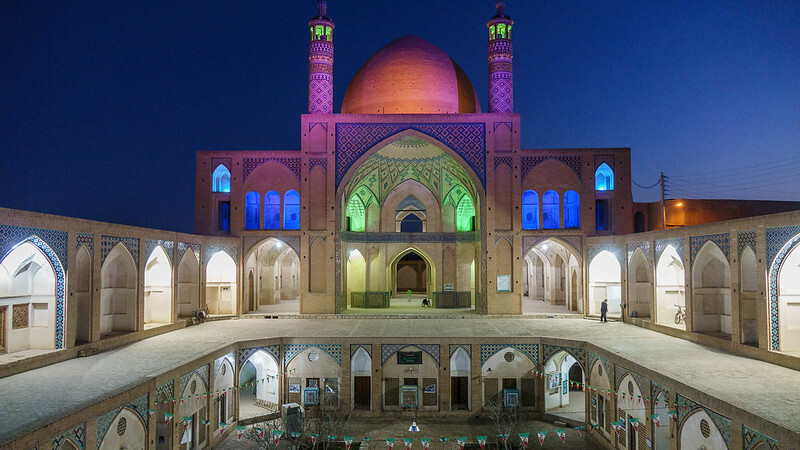 Jame Mosque, or Friday Mosque of Yazd. 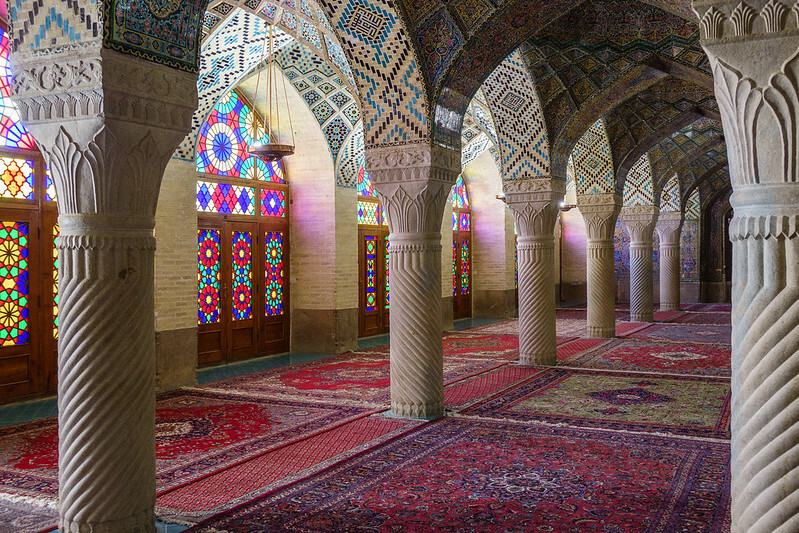 Every Iranian city has its Jame, the main mosque. 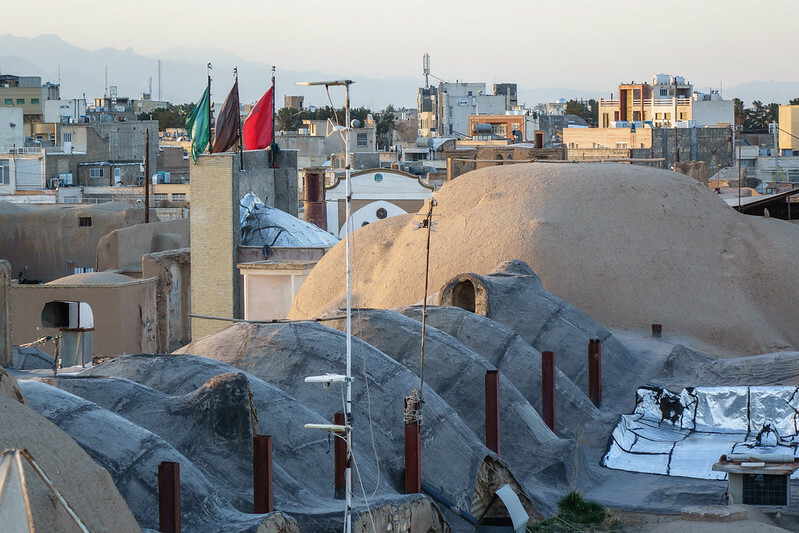 Wind towers, an ancient aircon system, are pronounced feature of Yazd skyline. Different door knockers for men and women. From the sound, it was possible to tell who was at the door, and decide who could go open it. Day trip to Chak Chak, outside Yazd center. 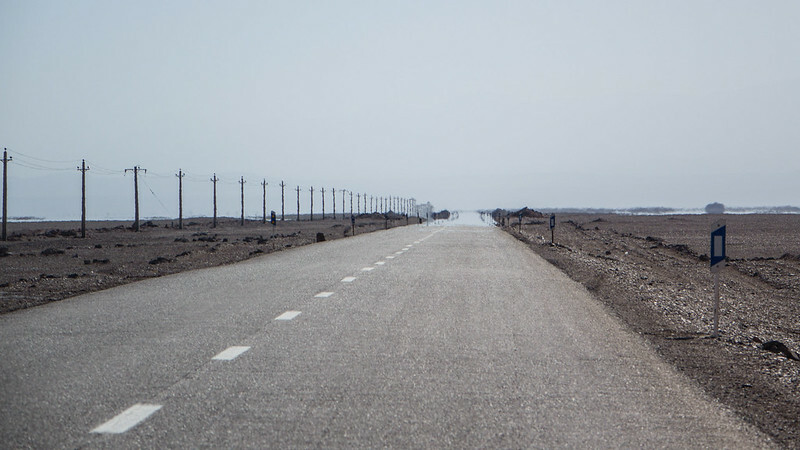 Road winding through arid deserts, surrounded by mountains further away. No traffic, heat is the norm, emitting from ground so its not possible to see outer reach of horizon. Eyes of imagination see caravans slowly progressing these infinite plains. Everybody in car are silent, looking mesmerised into distance. Chak Chak, drip drip. Name comes from slowly dripping fountain inside the cave temple, at the edge of mountain. This is Zoroastrian shrine, one of holiest sites of the religion. Its origins are in troublesome times when Islam had started to spread to Persia, 640AD. 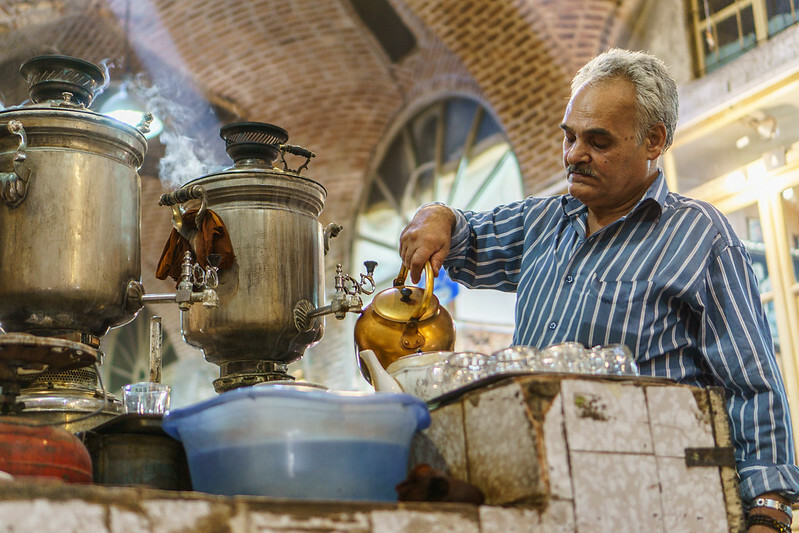 Zoroastrians not being Muslims had to flee these remote refuges, at the times of persecutions. 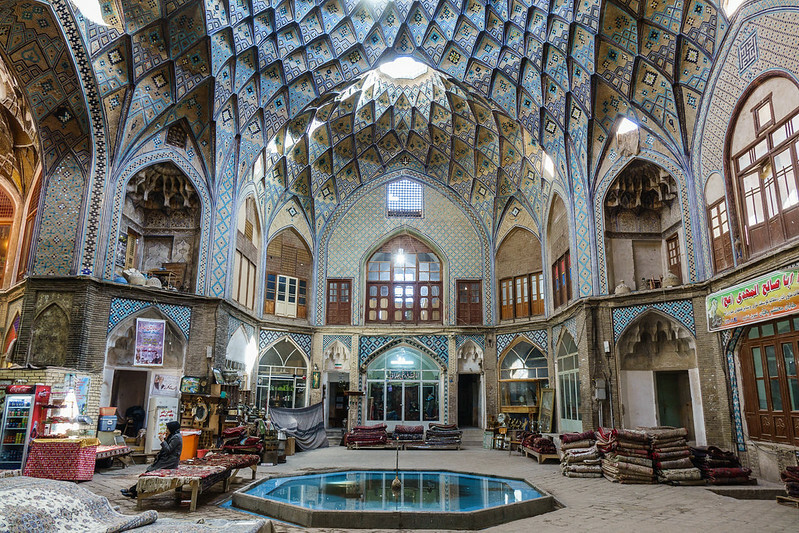 Zoroastrian fire temple in Yazd downtown. In many ways, Yazd old center reminds me Jaisalmer in Rajastan, other side of deserts that span over the lands of Iran, Pakistan and India. Here’s a link to a trip there few years ago. Arrival to Tehran has been nothing of usual affair. Came last night to one of bus stations at city outskirts. Haggled for a while with taxi guys, started driving to the street that supposedly had many hostels (according to WikiTravel). 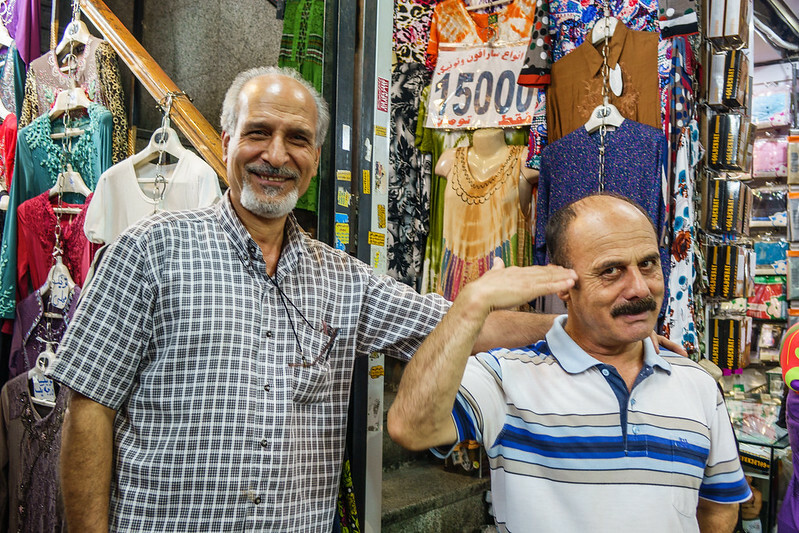 As a side note, Iranian taxi guys are lively folk to watch, especially when they have disagreement who can drive the next customer. Burst to argumentation is a norm, and I’ve seen even fists taken into use when making a point to disagreeing colleague! After arriving, all that was awaiting me was dark and empty alley where car repair shops work daily. And I had no idea where to head in this city of ten million. After wandering at streets (probably looking pretty helpless) for 15 minutes, an older man with motorbike stops by and waves me to hop at the back. I could not understand what he said, and he didn’t understand me, but since he looked normal enough and I had nowhere else to go, on we went! After riding awhile, we stop in front of a hotel and with a help of receptionist I now understand the my helper is trying to find a hotel for me! First place was full and every place where we stopped by, at 11pm, was either full or beyond my backpacker’s budget. After once again being turned away, we both started get hopeless and I felt being quite a burden to him. Man then talks to clerk again, who tell me that my friend offers to accommodate me to his home that night! Not wanting to be even more of a burden, but still having nowhere else to go, could not do anything else but gladly accept the offer. So last night was sleeping at his place. Sadly his wife had passed away recently, and the place was where he had moved recently. All his stuff was still in boxes. But slept well and got fresh start today. 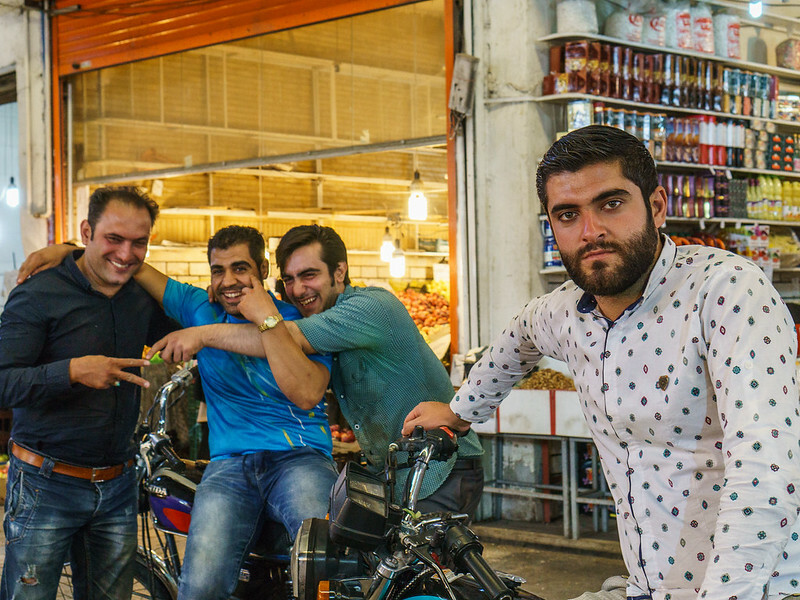 Iranians are hospitable folks! Thanks again Abrahim from Tehran! — Iranian currency is Rial, one US Dollar being around 30,000 Rials. As foreigner, better get used to all those zeroes in bank notes. What complicates things is the Toman, 10 Rials being one Toman. Iranians count and quote everything in Toman’s, but the bank notes that changes in hands are Rials. Combine this with possible translation mistakes, and foreigner can easily be rolling his/her eyes about how much something actually costs. — Cash is king. Iranian banks are closed from outside world, and foreign credit cards are useless least for the time being. Bring your whole travel budget with you.